Sepang Blue with Black Fine Nappa Leather, 1 Owner from New with Full Audi Service History, Stunning top of the range RS Q3! Cost New £46k with over £4k Extra's - 20" 5 twin spoke alloy wheels, Privacy glass, Electric adjustable/heated/folding door mirrors, Electronic tyre pressure monitoring, Extended matt aluminium styling pack, Audi parking system advanced with rear view camera, Hill hold assist, Auto dimming rear view mirror, LED interior light pack, BOSE sound system, Technology pack, HDD satellite navigation system radio single CD/DVD player MMI control system, Mobile phone preparation - High with Audi Connect. STANDARD FEATURES:- DAB digital radio module, Audi music interface, Voice control system, Light and rain sensor for auto activation of lights and windscreen wipers, 3 spoke flat bottomed multifunction steering wheel, Dual zone climate control, Heated front sport seats, Sports suspension, Audi drive select, Xenon headlights, RS design body styling + much more! 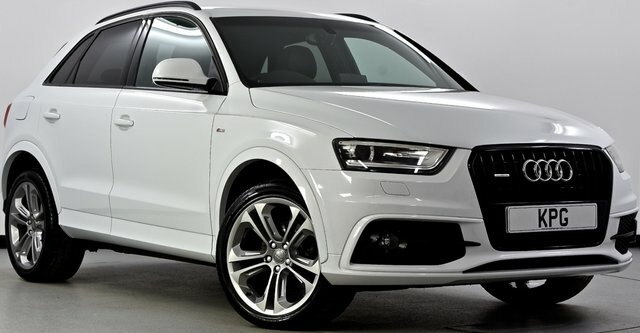 Ice Silver with Sprint cloth/leather - Black, 1 Former Owner with Full Audi Service History, Stunning example Q3 with £4k Factory Extra's! SPECIFICATION INCLUDES:- Comfort pack, 18" 5 double spoke design alloy wheels, Audi parking system plus, Cruise control, Aluminium roof rails, Electrically adjustable and heated door mirrors, Light and rain sensor for auto activation of lights and windscreen wipers, Xenon Plus headlights+washers+auto range adjust, S Line body styling, 6.5" colour display screen, Technology pack, HDD satellite navigation system radio single CD/DVD player MMI control system, Mobile phone preparation - High with Audi Connect, Colour driver's information system display, MMI - Multi Media Interface control system, Voice control system, Concert radio/single CD player with MP3 facility, Audi music interface, 3 spoke leather multifunction sports steering wheel, Black cloth headlining, Dual zone climate control, Remote central locking, Electric windows + Much More! Brilliant black with Black Milano leather, 2 Former Owners covered only 62k miles backed with Service history and recently serviced, Stunning example A5 Cabriolet! SPECIFICATION INCLUDES:- 19" RS5 Style alloy wheels and tyres upgrade, Cloth hood - Black, Xenon headlights with LED running lights, S Line Exterior styling pack, Fully automatic acoustic hood, Electrically heated + operated door mirrors, Platinum optic bumper blade, Auto boot lid opening, Rear acoustic parking system, Audi Exclusive controls pack, S Line Exterior styling pack - Cabriolet, 3 spoke leather multifunction S Line steering wheel including paddle shift controls, Mobile telephone preparation - bluetooth interface, Auxiliary input socket, Audi music interface, Colour driver's information system display, 3 zone climate control, Front sports seats including electric lumbar support, Perforated leather gearknob, Rake/reach adjustable steering wheel, Split folding rear seat, Light and rain sensor pack + more! Combining beautiful design and the very latest in automotive technology, Audi's range of compacts, saloons, sports cars and SUVs never fails to impress. 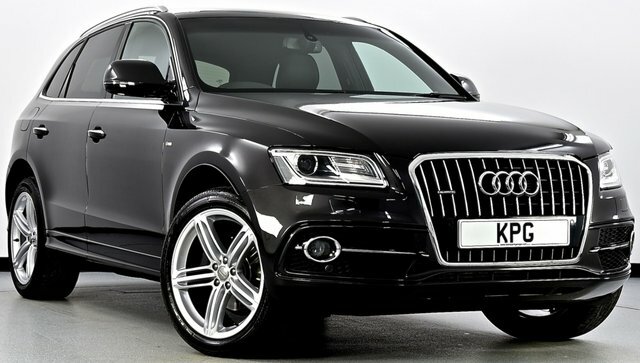 At Kaim Park Garage Ltd we stock a superb range of used Audi cars, with options to suit every budget. If you're looking for an executive saloon with the style, grace and power of a used Audi A6, a compact option like the Audi A1 or a thoroughbred sports car such as the Audi TT, our team is here to help. We offer the best selection of used Audi cars for sale in Bathgate and we'll always go the extra mile to ensure you find the right vehicle to suit your needs. Browse our latest stock here on the website and be sure to get in touch to discuss your requirements in more detail.